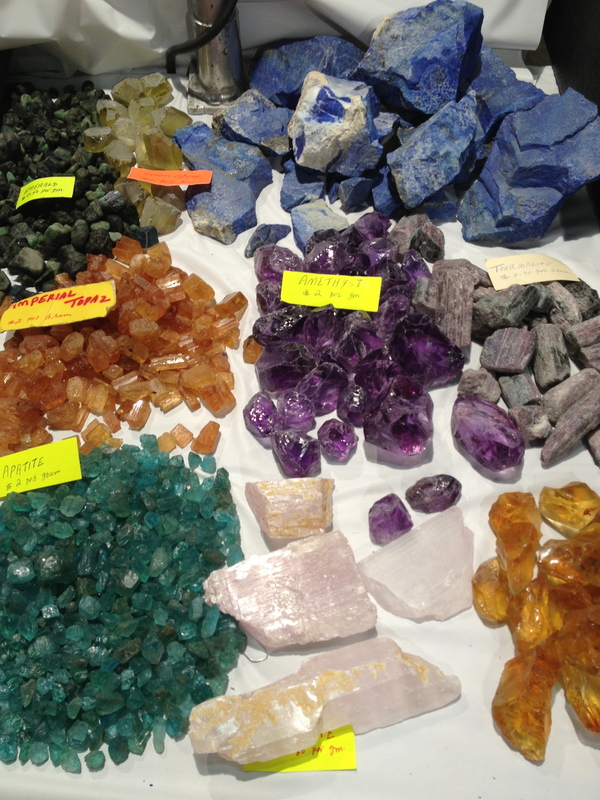 I found my favorite retailer at the Marlborough gem show this weekend – and of course went through all their cardboard ‘flats’ – the name of the industry standard 1.5 foot by 2 foot cardboard boxes replete with minerals. These folks are generally the only ones selling specimens in the whole show (of maybe 150 vendors). 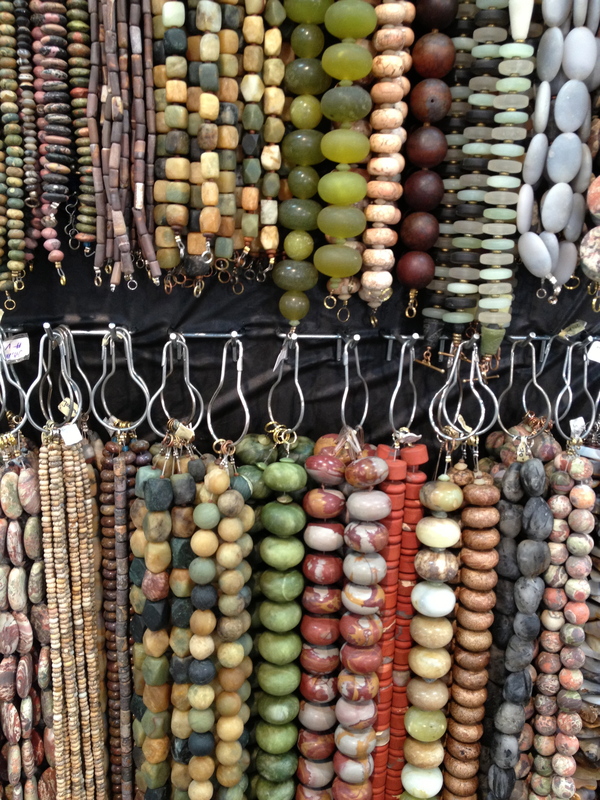 It’s really 98% jewelry, not even cut stones that much…and a lot of trinketry too. I overheard Rick [even my son remembered him when I got home (and he didn’t even come with me this time), as having the build of a wrestler, and – my edit – the spirit of a Viking]…I’m changing his name because this isn’t an official interview. I’m editorializing, and I don’t know that he cares to share all these perspectives publicly. I do, however, because they’re edifying (and interesting). At the moment I came up, Rick was disabusing a picky customer regarding her predilection for American mined stones, basically telling her to get over it. But I didn’t hear the whole conversation. So there’s not much more I can say about that…my conversation with him was grist enough for my own mill. 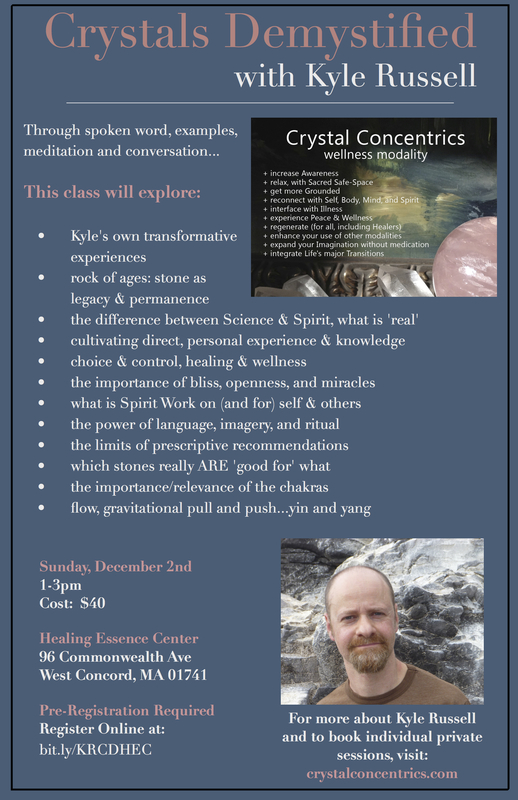 First, I handed him the info sheet to my upcoming Crystals Demystified class (being held Sunday, 12/2/12, from 1-3pm). He had an opinion (of course). My sense was that he was invested in sharing some of his own ideas with these ready listeners – through me – and I guess that’s what’s happening. We sparred over polished vs. natural stone. 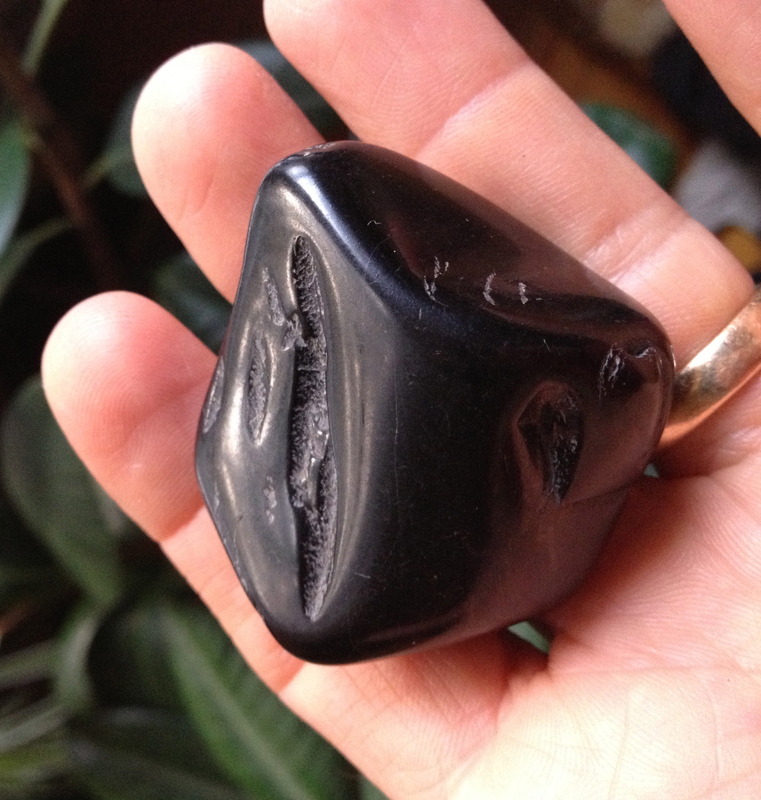 Specifically, I was saying that I’m seeking rough Sugilite, and polished pieces won’t do. The same is true – for me – with Lapis. He took umbrage at the notion that one (rough, he assumed was my favorite) is superior to the other. Rick argued that polishing is merely the rubbing of finer stones against others (what could be more natural?) – and that it’s not an adulteration or diminution of their value, energetically. I couldn’t agree more, actually – and as usual (‘in my book’) – it depends on the piece. 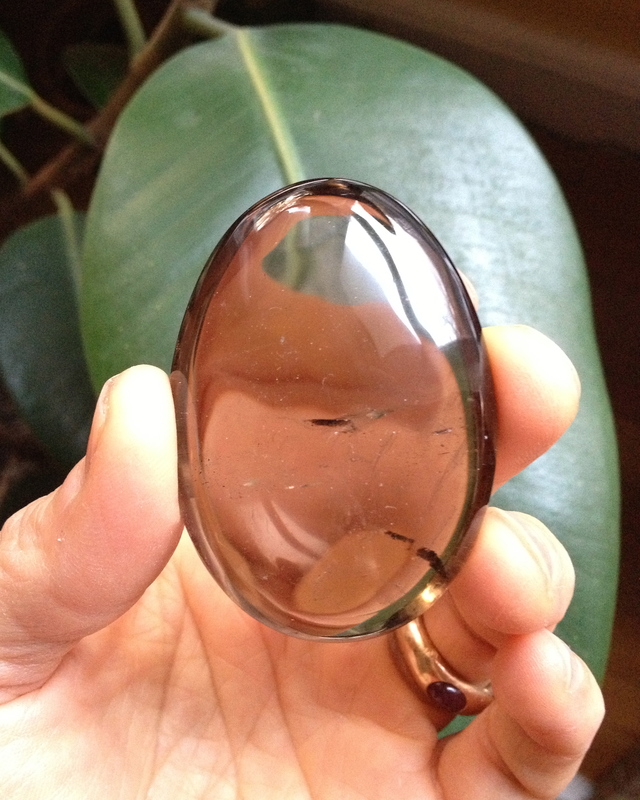 Certain stones, you can ‘access’ their energy better if they’re polished…others less so. I know which is which, for me, but time didn’t allow – and it wasn’t called for – to have me enumerate which was which. He said: “to all those people who want to be snobby about their ‘natural’ pieces” [and I paraphrase here, as I have been throughout], “I want to empty a wheelbarrow of muddy, silty mine-fodder in front of them and say ‘how’s that for natural’?” Many of us want our stones washed and tidy, which is a form of processing in itself. 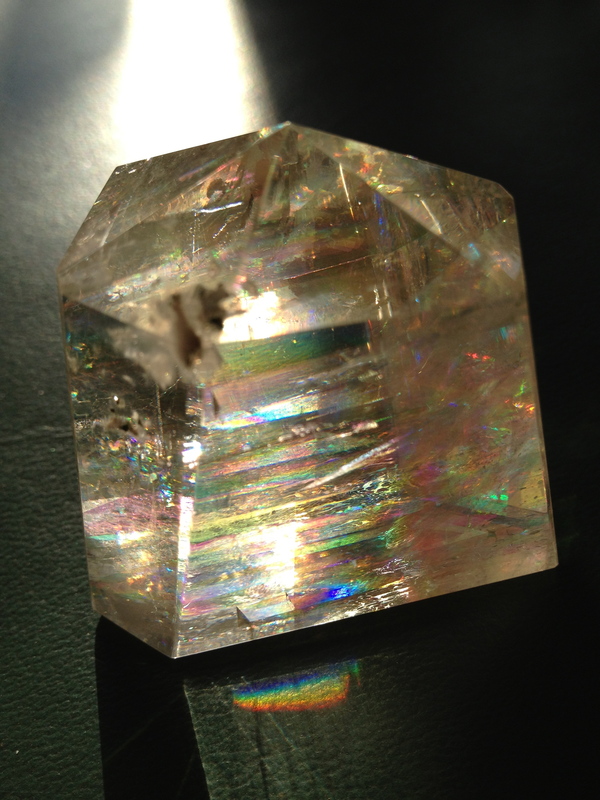 I myself would rather wait and sift through gem show collections than go sling a hammer in the field. I’ve done it – a little – at the public Herkimer diamond mines. I admire (and of course respect) those who do…who get and convey all the stones I’ve ever seen ‘to the table. But that’s not my role or specialty in this ‘business.’ I put quotes around ‘business’ because it isn’t really a business, only…it’s a passion, and a mission (for some of us). I’m a selector, collector, and conveyer of information, teaching, and process…that’s by ‘job.’ I quote ‘job’ because it’s not a J.O.B. – it’s a calling. Now back to my account. Rick admitted that as someone who buys and sells rocks full time, he’s got a vested interest in getting his head around the metaphysical piece. But before he got into that, he had some more schooling for me. We talked about the various techniques by which balls are polished out of chunks (and cubes)…including by hand (where electricity is less reliable than person power). 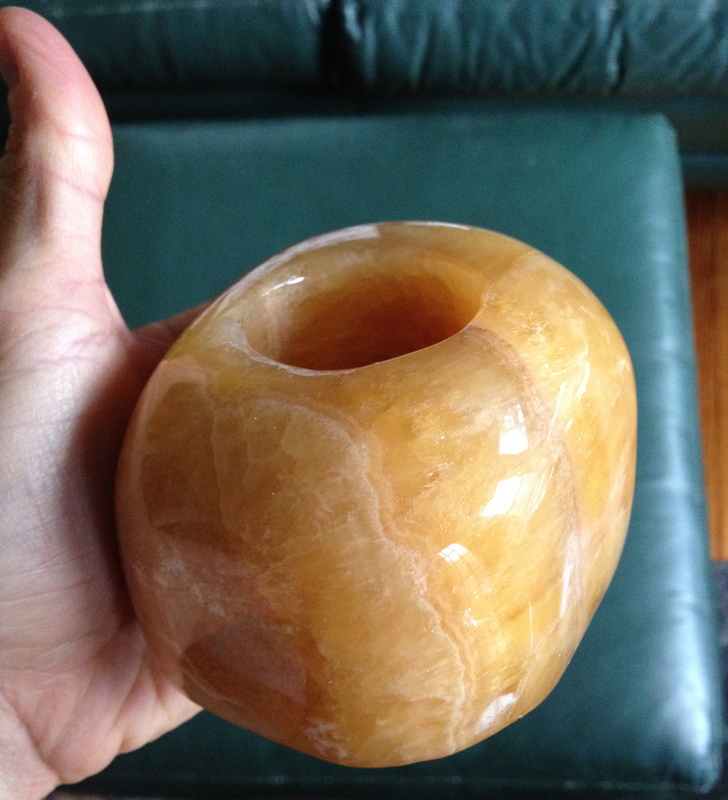 The 3 Jet balls I purchased – nowhere have I seen any, but small examples of them before – these were clearly hand wrought (and from Poland, which is unusual, as I haven’t heard of Poland being a source for Jet, previously). I learned that most of the Afghan Lapis comes from three mine shafts into the ‘blue mountain’ – apparently visible as such, from miles away – during Biblical times. These mines date back to before the Egyptians. Each delivers a different grade of Lapis. I bought a sliver of ‘midnight grade’ Lapis Lazuli – the only one he had on display (or maybe the only one left, as I arrived on the afternoon of day 3). I haven’t decided whether or not to sell it. For now it’ll accompany my own, similar piece…but check it out (in the picture here, to the right)! Going back to his diatribe about ‘rough’ vs. polished – Rick made a couple of references to his analogy that turning someone on to a raw fish & vegetable diet that they hadn’t ever tried before – would surely result in upsetting their stomach and turning them off to the whole idea, healthful as it may be. He said basically: you have to crawl before you can walk, and small, cheaper, easier to hold tumbled rocks do just fine as ‘gateway’ crystals. Then we got into something really quite interesting. He said “if I put a chunk of Plutonium in your bed, you’d start losing hair and bleeding from your gums in a few days. Yet you can’t see it’s energy, or even feel it. I’d like to try that on someone who says they don’t believe rocks have any energies. If one element can do that much harm, there’s got to be other rocks that can have the opposite effect on your well being. Problem is, how can I prove the well being piece? It’s easy to show that something killed you – but you can’t easily show that something healed you” – or reproduce the results handily, from one person to the next. Funny (sad, really) how much easier (or reliable) it is to destroy than to create. And yet, I’m astonished how some homeless people – who I know are living the hard life – survive year in and year out. We are a resilient race – some of us survive even the worst tribulations – while others succumb so easily to them. Another example of how/why rock power is a force to contend with: Rick said “during the Great Depression, some women in Appalachia were called crazy for eating dirt…yet their diet was devoid of iron. They needed it for their metabolism, even though they didn’t know the real reason they were drawn to eat dirt.” Rick said: “we’re eating dirt ourselves, only in the form of the plants and animals that are able to transform its various elements into digestible, assimilable nutrients. Our bodies are filled with elements, metals, and minerals” – they’re called mineral supplements, aren’t they? Yet people feel a disconnect. They’re like – yeah, but that’s food – these are just rocks. Some of them are – with no perceptible energetic ‘value.’ And Rick said as much. But to not recognize the unbroken continuum between us and the very material that makes up our planet (and our bodies) – which preceeds us by millions (and billions!) of years, is kind of like living with a huge blind spot in front of us – don’t you think? I watched the Lincoln movie last night, and there was dispute on the floor of the Congress about whether full equality under the law, for African Americans, would lead to full voting rights, representation, and intermarriage…or even votes for women (still 50+ years away from that discussion in 1865). Those attitudes now seem embarrassingly outdated – but that’s what some people thought (and truly believed) – just like the folks 500 years ago, who scoffed at the notion of the world being round, or its revolving around the sun. I used to – and still kind of do, physiologically – think the human being stopped evolving some time ago. Sure, there are modern pathogens, GMO’s, and electromagnetic bombardment. Those must be having their effect, changing us in ways we don’t know. There doesn’t seem to be any ‘survival of the fittest’ dynamic at work any more – everyone lives long enough to reproduce – whether they choose to or not, is another story. Our bodies are essentially as they were 100,000 years ago. But after watching the movie “Happy” – which showed the radically different brainwaves and cortical activity of someone in a meditative state – I’m starting to think it’s possible that our brains can evolve, even in our lifetimes, as we pursue discipline,training our capacity to apply our mental abilities in new and different ways. This is promising, and encouraging to us, as a race. We have the power to adopt new mindsets, make whole different outcomes unfold in the world (and our lives!). There’s a reason it’s said that G*d created the world out of sound, or ‘The Word.’ That is the power of our imagination, and intention. Flight was impossible till someone thought about it seriously, and put mind to machine, making it happen. We’ve realized that our body is made up of billions of organisms – not just one – because of the important role of co-habitating bacteria in our gut (and all the outcomes beyond genetics, that impact our health, as a result of that). We are not in this alone – not just inside of us – but outside, above, and all around us. What I’m saying is that we are inextricably bound up with the world around us – not just an island, cut off – and our willpower can move mountains. But I digress – though the above is important – and certainly part of my own, ‘unfoldment’ recently. Our consciousness is like a flower, first a tight and impermeable bud, but then developing into a beautiful flower, before withering away, and leaving only the memory of its splendor, in the words, works, and impressions we’ve made around us. Ours is a powerful instinct to seek out what we need. People often say “you teach what you need to learn.” I have a powerful desire to connect and be grounded to earthly things (and vitality). That is because I’ve had the tendency (and constitution) to be airy and slothful at once. You might not believe it – and I have to remind myself: I can go that way – but it was my original constitution, which I’ve taken years to transform (over the past 30 years). I’m still working out my process, fighting certain battles, trying to improve my self. Rick’s point, in addition to all the above, is that you really have to tune into yourself, find out what it is that you’re craving (or need), and pursue it open mindedly. Don’t be dogmatic or limited. Say you need vegetables in your diet – but you only eat broccoli – and there’s no broccoli around – what do you do…starve yourself of vegetables, holding out for that broccoli, which simply isn’t available? As the 60’s tune goes: “if you can’t be, with the one you love – honey – love the one you’re with.” Not that I’m advocating for infidelity. You have to take the sentiment with a grain of salt. Seriously: take advantage of what is, don’t get hung up on what isn’t, because the here and now is all we really have. Yes, there’s memory, longing, and wishful thinking – but hear me out – there’s a specific point we’re making here. It’s a pet peeve to Rick (and to me too) when people say – “I’ve heard this is ‘good for’ such and such, and ‘that’s all I’m really looking for” – to the exclusion of all the other stones before them. Rocks come in and out of ‘season’ (ie. vogue, or availability) or simply aren’t in stock at any given time. Different stones can ‘do’ the same things for you – or close enough. It’s not wise to be limited by what’s written in the books. Experiment – get in touch with the energy (or ‘nutrient,’ to use the dietary model) that you’re seeking – and latch on to whatever matches that, feeds that, serves that desire. It may be a totally different variety, size, shape, or color than you expected. And connect. Take advantage of it. Use and savor what it has to offer! To find out more – please email me at, Kyle Russell – at CrystalConcentrics@gmail.com. 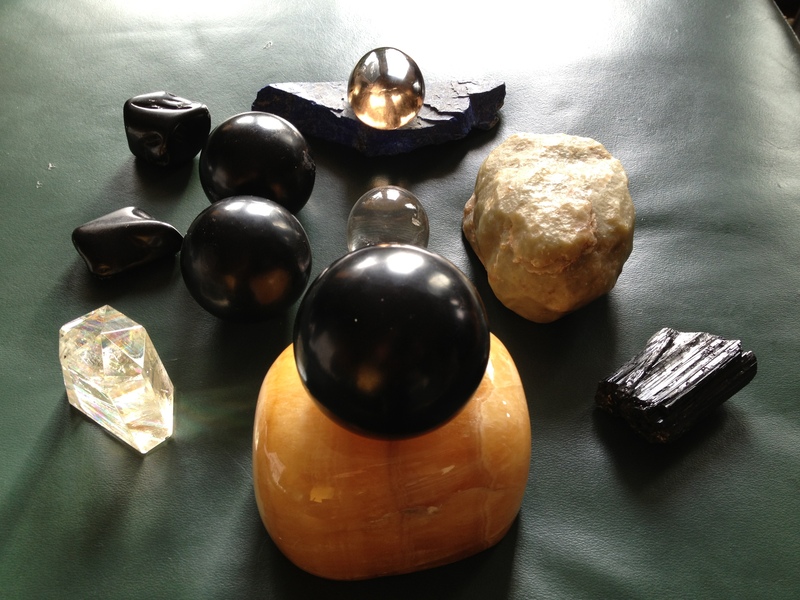 If you’re Metro-Boston, please Register to take my class “Crystals Demystified:” Sunday, December 2nd, from 1-3pm (in West Concord, at the Healing Essence Center)…here’s the info link for the class.